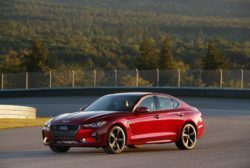 The 2019 Genesis G70 goes on sale this week with either a 2.0T inline four-cylinder turbocharged engine or a 3.3T V-6 twin-turbocharged engine. G70s equipped with the 2.0T engine are available in six generously equipped trim levels, including a special manual transmission Sport package, with a starting Manufacturer’s Suggested Retail Price (MSRP) of $34,900. The G70s equipped with the 3.3T engine are available in four generously equipped trim levels, plus two limited production Special Edition models, with a starting Manufacturer’s Suggested Retail Price (MSRP) of $43,750. G70 2.0T is offered in six trim levels: Advanced, Elite, Prestige, Dynamic, Sport and Sport M/T, while G70 3.3T variants are available in four trim levels: Advanced, Elite, Prestige and Sport. The two limited production Special Edition 3.3T packages: Dynamic Special Edition and Design Special Edition, will only be produced in quantities of 400 units each. Every G70 sedan comes standard with class-leading active and passive safety technology, refined interior appointments and driver-focused features. MSRP excludes $995 destination charge.